Are You Ready for Malnutrition Awareness Week™ 2015? A.S.P.E.N.’s 4th annual Malnutrition Awareness Week™ will be held September 28 – October 2, 2015. In 2009, A.S.P.E.N. 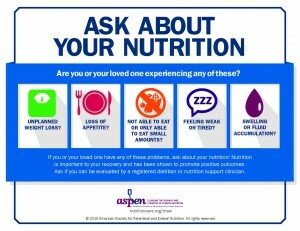 recognized a need for greater awareness of malnutrition, which is common in hospitalized patients in the United States and is associated with unfavorable outcomes including higher infection rates, poor would healing, longer lengths of stay, and higher frequently of readmission. No unexpectedly, these outcomes are associated with increased costs. In some studies, 30-50% of patients become malnourished, often during a hospital stay. A.S.P.E.N. is excited to announce that the week of educational programing and resources is free to members, with an additional bonus to obtain continuing education credits during the two webinar days. Visit the official Malnutrition Awareness Week™ page for the schedule of events, and to register. Interested in spreading the word about this year’s Malnutrition Awareness Week™? Check out the buzz kit for newsletter and social media posts.